After months of silence, No Man’s Sky gets a free Version 1.1 “Foundation Update”, and it is now live on PlayStation 4. Director Sean Murray has even spoken up about the future of the game. Hello Games has also released a rather lengthy report and a six-minute long video of the new features that were added, but we’ll break it down for you here. No Man’s Sky now has three different game modes: Normal, the original mode; Creative, described to have no limits to allow you to build a huge base; and Survival, a challenging endurance mode (expect to die a lot). Base building is now a feature in the game. It will allow players to set up a home base on a planet, outfitting it for shelter and resources, as well as enabling you to hire alien workers. 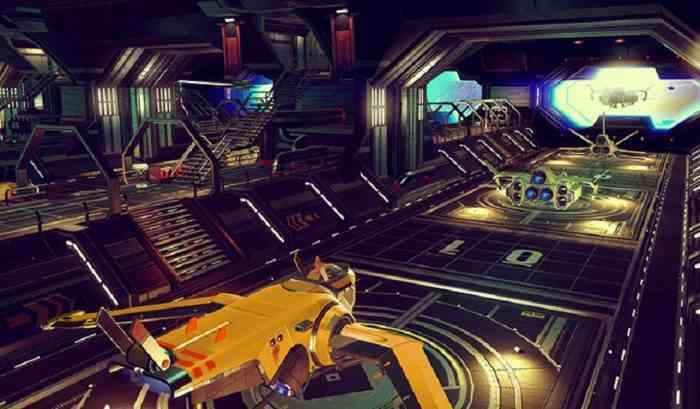 Players can now purchase enormous Freighters, which have customizable interiors and expandable cargo holds. Like your home base, you can also hire workers to help manage your resources and research technology. The UI has been improved with stackable item slots, shortcuts, and a more streamlined menu. Photo mode has been added for PS4. Dozens of smaller fixes have also been added to improve player experience, listed out in the patch notes. This update is currently only available on PS4, and is to be the “first of many free updates” for the game. What do you think of No Man’s Sky’s Foundation Update? Will you be returning to the game? Let us know!